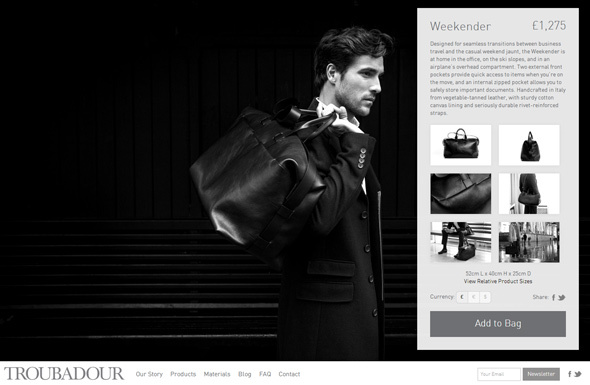 Troubadour is a men’s luxury leather goods company based out of London. They are dedicated to an incredible level of quality, and advocate the stories and talent of the craftsmen/women that have made their products what they are. I was tasked with creating a custom Shopify theme that is consistent with their brand and its attention to detail. The site was designed by Creative Director Robert August. The theme is fluid-width and responsive; it shrinks and expands to accommodate the browser size, whether it is a wide desktop monitor, a tablet, or a mobile phone. The main menu changes to an expanding navigation accessible by a touch-friendly icon, the sizing and number of items per row in the the products grid adjusts, and the product description is only aligned at the bottom for large screens. This design makes use of an unusual fixed bottom navigation, subtle CSS transitions, SVGs, retina display optimized images, and some stunning custom photography.